The Ramblings and Adventures of a SAHM with Furry Animals. McKayla went on her very first field trip a couple of weeks ago to the Apple Valley Orchard. Since it was a "special" day, Daddy and I had breakfast with her at school and then came back a little later to pick her up (Pre-K doesn't have bus service, so the parents had to pick them up from school and take them to the Orchard). We arrived at the Orchard about 11:00 and had lunch at the pavilion. Then they took us on a tour of the facility, showing us how they cleaned the apples, made apple cider and all the workings of an Apple Orchard. They told the story of Johnny Appleseed and then took us on a hayride through the orchard. Afterwards, they told us the history of the Orchard and the many different kinds of apples they have. 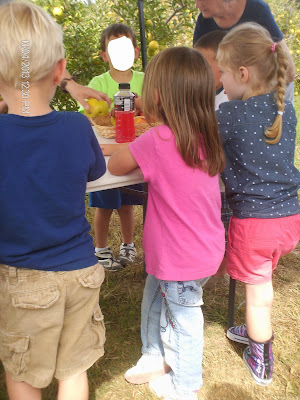 At the end of the tour, they sent each of the kids home with some yummy apples and a cute little apple-shaped container with some homemade apple cider..........yum! An Illustrated Standard And Guide for the Evaluation of the Great Dane This booklet has been prepared by The Great Dane Club of America to assist fanciers, breeders and judges in their assessment and understanding of desired Great Dane type. Nothing in the discussions or illustrations contained herein should be construed as altering or contradicting the provisions of the Official Standard of the Great Dane adopted by this club and approved by The American Kennel Club. It is rather to be considered as a supplement to, and expansion on, the Official Standard. I'm a SAHM and have 2 wonderful children and a fantastic husband who puts up with all my obsessions. We have a Great Dane, a Chihuahua, 2 cats and a Hamster. I'd love to have more critters, but I've stopped.....for now LOL.